Home Business What next for Siemens Alstom in the UK? Staff at the launch of Alstom's train modernisation centre in Widnes. Credit: Alstom. On September 26, it was announced that Alstom and the Siemens Mobility would merge, or, as the joint press release stated; a “Franco-German merger of equals”. What are the implications, particularly for the UK? It has also supplied the Citadis trams for Nottingham Express Transit and supports its other reasonably recent products, diesel multiple units, classes 175, 180 and electric multiple unit class 458 as well as London Underground 1996 tube stock. In contrast, Siemens has supplied or has on order nearly 3,000 cars, the majority of which it maintains. 444, 450, 707 – and GTR – classes 700 and forthcoming 717). Looking forward, both companies have tendered for London Underground’s Deep Tube programme for up to 250 trains and, no doubt, will have expressed interest in the ‘conventional compatible’ trains for HS2, the forthcoming large requirement for the Docklands Light Railway and whatever bidders for the forthcoming South Eastern franchise might require. We might perhaps one day see designs that originated with Siemens being assembled at Widnes. More widely, with both Alstom and Siemens having competing product platforms over virtually the entire range of passenger rolling stock from trams to high speed, consolidation of designs and, no doubt production facilities, is inevitable. doubt be a concern to Network Rail. That said, perhaps the increased strength of the merged companies provides further opportunities for innovative funding so keenly sought by Network Rail and the government, particularly in the context of the Digital Railway/ERTMS programme. London Underground’s Victoria and Central lines depend on different Siemens’ legacy proprietary automatic train control products. It will be interesting to see whether Alstom’s Urbalis or Siemens’ Trainguard MT becomes the group’s preferred metro product or whether they co-exist. It would be easy to say that ERTMS sets a standard for main line signalling (at least in areas influenced by European standards) but the two companies still have their own products for both sides of the ERTMS defined air gap and communication protocols and messages. Rationalisation is inevitable. it was at Innotrans in 2016 that Alstom highlighted to Rail Engineer the increasing importance of infrastructure work to their business, when they demonstrated, inter alia, resilient sleepers and electrification catenary systems. In partnership with Babcock and Costain, the ABC partnership has been fitting out the tunnel sections of Crossrail with the railway systems and has been electrifying the Edinburgh-Glasgow route. Despite what might be described as “challenges” on other electrification schemes, these two contracts are being delivered largely on time and to cost. We must remember that the merger has only just been announced. It will probably take many months before regulatory permission is obtained, and then it will be interesting to observe which products become dominant. This article was written by Malcom Dobell, an experienced railway engineer who was formerly the head of train systems for London Underground, working on the engineering of every train fleet on the network. Well Siemens are still manufacturing the Thameslink Class 700’s 12-Car and have completed manufacturing the 8-Car 700’s. The Class 717’s that are to be manufactured for Great Northern to replace the Class 313’s on the Moorgate Line and Hertford North Loop Line. Plus with more Class 707’s for South Western Railway to be built in which SWR are to replace them with Bombardier Class 701’s Aventras. In which Southern might be using the Class 707’s to replace the Class 455’s on suburban services or could go to c2c or Great Northern. 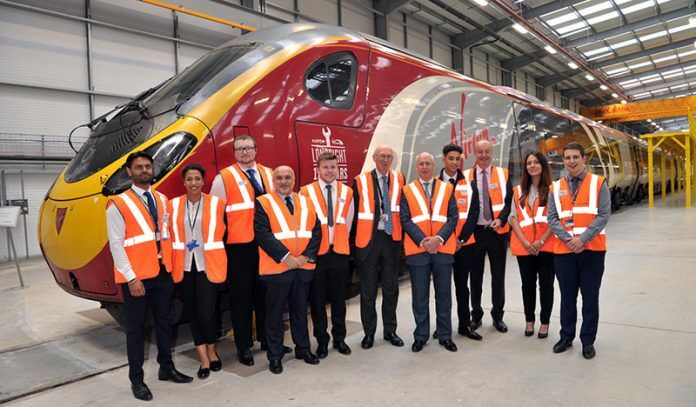 Alstom have manufactured the Class 390’s Pendolinos for Virgin Trains. Aswell Class 334’s for Scotrail, Class 180’s for Great Western Railway, Hull Trains and Grand Central which GWR’s Class 180’s will be transferred to Grand Central along with Hull Trains Class 180’s because of Hitachi Class 800’s and Class 802’s IEP’s that are to be built for GWR and Hull Trains. Class 175’s for Arriva Trains Wales and Class 458/5’s (formerly Class 458’s 4-Car) for South Western Railway (previously South West Trains) which Class 460’s that were operated on Gatwick Express before they were converted to 5-Car Class 458’s for SWT (currently now-SWR). As Gatwick Express now has got Bombardier Class 387/2’s electrostars. As of Which SWR are to replace the Class 458/5’s with the new Class 701’s Bombardier Aventras.